I have started this topic as a repository for issues related to the GUI. These issues do not affect the functionality of the printer. The first issue is a spelling error. Filamnet should be filament. The one item I would most like to see added to this list is Material, since I may not remember what material it was sliced for, and it is vital to have the correct material loaded. Perhaps two of the above (e.g. Layer height and Object height, or Filename and Size) could be placed on the same line to allow an extra line to include Material. Or perhaps Material could be on the same line as filament needed. We would also like to remove the hrn that is always inserted at the beginning. When you pause printing, it would be nice if the build plate got lowered. Common reasons for pausing a print are to inspect or modify the print (e.g. insert a magnet in an open area). Both of these are easier if the build plate is lowered. Obviously, the build plate must be repositioned when the print is resumed. The bed should lower 5mm and the tool head should move to the back right corner when a pause is initiated. Is that not happening, or would you like to see the bed drop more? I believe it would be most useful to drop the bed all the way to the bottom. Is there any disadvantage to doing this? Not particularly, it just slow and personally I tend to be impatient. You use the manual jog controls in the Control tap to move the bed down more if you would like. The printer will move back to the correct z height when you resume. Thanks, John. I'm not sure where to find or how to operate the manual jog controls, but I would be happy to give this a try. I'm not sure why someone would pause a print if they didn't have a reason to inspect or fix something, either of which would be facilitated if the build plate drops to the bottom. And if someone does want the build plate to drop, it would certainly be faster if this happened automatically rather than having to perform this operation manually. Manual jog controls are located in the Control tab at the bottom. When on the control select the move button. You can jog an axis, the printer remembers where it was, so no need to try to move things back to where they were before resuming. I will look into and test dropping the build plate all the way to the bottom. I have had never used a printer that drops the build plate or raises the tool head more than about 5 or 10mm during a pause, but that does not mean it could be useful. Thanks, John. I have just tested the manual jog controls, and moving a positive value in the Z axis does drop the build plate. And the build plate does move back to the correct level when the print is resumed. So, this is certainly a short term solution, but probably less convenient for most users. For what it's worth, the Ultimaker 3 Extended does drop the build plate all the way to the bottom when a print is paused. Coincidence??? When I resumed my print, no more filament was extruded. Apparently the filament had jammed at or near the point that I restarted the print. This was near the end of an ABS print of the Klein vase I previously printed with PETG and showed you yesterday. 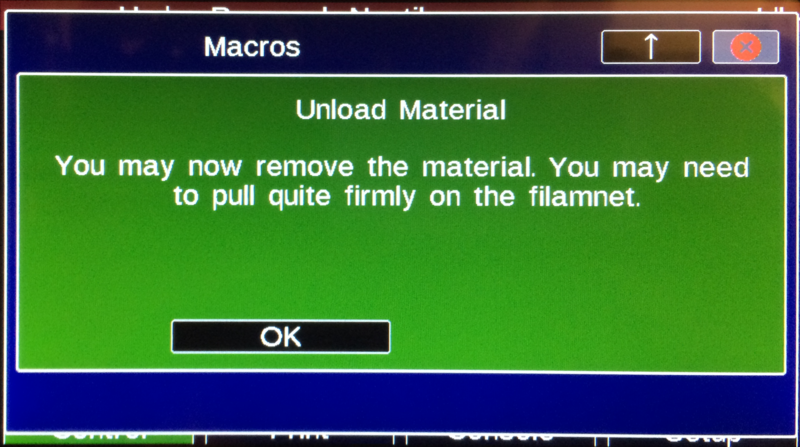 That is odd, I have had material jam on pause before. The material is retracted 10mm, which I have been thinking about reducing. Depending on how long you had the printer paused, the material might have swelled up in the hotend as 10mm would still leave it in the hot zone. I will make some changes regarding this for the upcoming firmware update. Thanks, John. I'm not sure how long it was paused -- perhaps as long as 15 minutes -- since I was working on something else at the same time and might have been distracted. I am guessing that most times, pauses will be short, but someone might take a phone call or otherwise be distracted, and leave the printer paused for a long time. The printer should handle this and not jam even on a lengthy pause. I mean to say I have not had material jam on pause in my last message. I agree that pausing for a long time should not cause a jam. I can't say for sure what happened in your case, but I will look into tweaking the pause to reduce the likelihood of jamming on long pauses.